At the Annual Meeting members looked back at the developments this year, including the new members, tools and projects. In addition, we further elaborated the plans we made during the IWA World Water Congress in Tokyo. These mean that Watershare members will focus on emerging substances, resilient urban water management and future-proof water infrastructures in the near future. Moreover, to broaden the scope of collaboration and partnerships instead of focusing on tools, Watershare will focus on actual collaboration on the basis of tools. Over the year, we had the pleasure of welcoming DIAM (Oman) and AySA (Argentina), as two outstanding and ambitious water utilities. New tools were developed and uploaded to the Tool Suite, and several new application reference projects were developed, with the recently launched NextGen project as a pivotal example. Many Watershare members are participating in this ‘water in the circular economy’ project, which nicely illustrates the growing cooperative spirit in the platform. 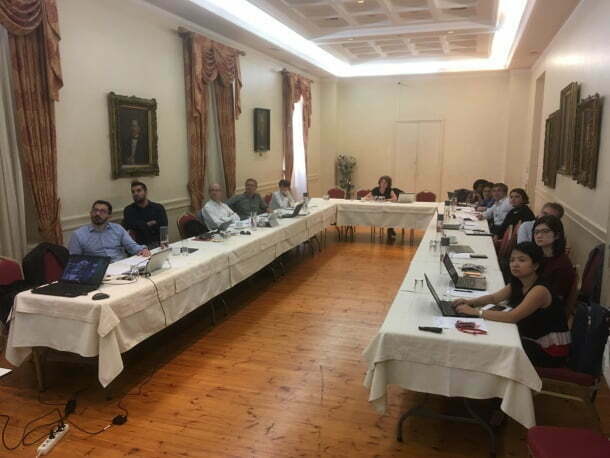 Following up on our discussions at IWA Tokyo, the Athens attendees discussed and agreed on actions for 2018/2019, with the Communities on Practice (CoPs) on Emerging Substances, Resilient Urban Water Management and Future-proof Water Infrastructures as priorities. The COPs on Subsurface Water Solutions and Resource Recovery and Upcycling will continue activities in line with actions already agreed before. Annual Meeting in the historical Kostis Palamas Building of NTUA, Athens.